I’ve almost exhausted my interest in California’s suicidal fiscal policy. How many times, after all, can you write about politicians over-taxing and over-spending to the point of economic ruin? But everyone has a cross to bear in life, and (if you allow me to mix my metaphors) griping about bloated government is my Sisyphean task. So here’s a good cartoon about the bankruptcy of Stockton, California. I assume the California egg is supposed to be Governor Brown, but that’s not important. The obvious lesson is that the entire state will follow Stockton into collapse unless there’s a dramatic shift in policy. 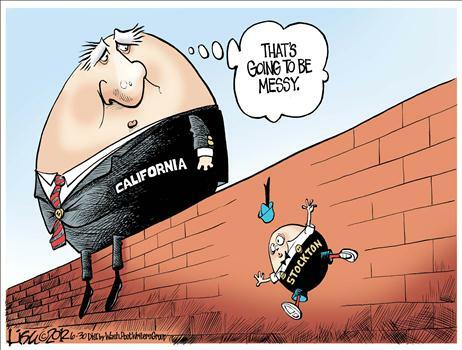 As explained in this video, the main problem with state and local governments such as California and Stockton is that there are too many bureaucrats and they are paid too much (this cartoon makes the same point in a more amusing fashion). But to be more specific, what’s killing them are the promises for retiree pensions and health care. Interestingly, the federal government also is heading toward a fiscal cliff because of promises to spend money on retirees, but the nitwits in Washington have created entitlements for the entire population and not just for a privileged class of bureaucrats. So the moral of the story is that as goes Stockton, so goes California. And as goes Greece, so goes America. P.S. You can see some other cartoons from Lisa Benson here, here, here, here, and here. P.P.S. Here’s a great Chuck Asay cartoon about California. Living in Cali my entire life I can smell the desperation from the entire leftist cabal. Even the dumbest moron can clearly see the freight train is coming and the brakes have been cut by Democrat/Marxist coalition, dooming us all. This is the goal of Marxism after all. Destroy Capitalism. Joe McCarthy was SO RIGHT and nothing illustrates and proves his words were correct more than California in 2012. The sooner the better. And that goes for the rest of the country as well. The sooner the inevitable collapse the sooner the rebuilding can start. It could be the only glimmer of hope my grandchildren have. Nice post Dan, great cartoon. You may not want to bear that cross, but at least someone is willing to. Unfortunately it’s not someone in California, but the time will come. Keep fighting.